Hiking Trolltunga, Norway, that place you’ve seen on Instagram travel accounts a bazillion times, is the most adventurous thing I’ve done in my life. For me, that’s saying a lot. I’ve traveled a fair bit in my lifetime, and I can’t think of anything else I’ve done that was more strenuous or exhausting than this hike. I even learned a few new things, and was reminded of some lessons I had forgotten. Here are 5 things I learned from hiking “Troll’s Tongue”. Yah OK fine so I’m a bit jealous… ANYWAY. My one friend from Alberta, particularly liked to point out how Trolltunga, and most of Norway in general, very much reminded her of British Columbia. I’ve managed to visit about 90% of North America, with one notable exception: the Pacific Northwest region. My BC friends love to talk about how beautiful it is, and I’ve seen many pictures of it. But if it looks anything like the Norwegian fjords I witnessed, I’ve figured out where I’m going for my next trip. I had access to full LTE coverage for nearly the entire hike. Only at the peak did it drop to a measly 3G. This peak is 1KM high, by the way. Apparently, this is actually quite new, and was put in place because unprepared tourists keep stranding themselves up there. Dead tourists are bad for tourism, it would seem. But, more importantly, this means you can now live-post your journey on Snapchat or whatever. (because if it didn’t happen on social media, did it really happen?) Thanks dumb tourists! And they will do dumb things. This is not just another tourist attraction. This is an intense hike. There are many people who simply won’t be able to do it. But that won’t stop them from trying, of course. Because, while it may be warm and toasty at the bottom, it’s about -10C at the peak. My friends and I did our research. We were hiking Trolltunga just 6 days before it’s considered too deadly to attempt. We read other people’s experiences, constantly checked the weather, and even asked the locals if it was a good time to go. We were very fortunate that the weather was perfect. If it wasn’t, we likely wouldn’t have attempted the hike. Be smart people. And don’t get me started about the people doing ridiculous things for that perfect photo at the top. A handstand at the edge of a cliff with a 700m drop is the definition of stupid, and people have actually died here. And if one of us started to hesitate, the others would push them to keep going. In short, surround yourself with people who share the same values as you. If you want to be adventurous and test what you’re really capable of, spend your time with those who love doing the same. People who push you to do more, be better, and try harder are the types of people you want to be around. Otherwise, how will you really know what you’re capable of? From the very moment I booked this trip, everything I read, saw, and heard told me that I was making a mistake. We were even starting to second guess ourselves. Were we in over our heads? This is the part where having like-minded friends to push you really helps, by the way. While it made us a bit more nervous than we anticipated, we didn’t let any of this stop us. And you know what? Everything went perfectly. The weather was unbelievably beautiful for our entire trip. Even the Norwegians were blown away. And all that stuff people wrote about how deadly and scary Trolltunga is? Overblown. It is very difficult, for sure, and you need to prepare well to hike it safely. But the way these people had described it you’d think we were climbing Mount Everest in a hurricane. If we had allowed other’s opinions to influence our thoughts and decision-making, we may have backed out of the hike entirely. If you hike Trolltunga in the summer, when everyone else does, the lineup to take a picture at the summit can be over an hour long. For us? The longest we waited was 5 min. We even went back several times to take pics from different angles. Anyone who knows me is aware of how well I handle waiting in line for things, which is to say NOT WELL AT ALL. So, while it is always a good idea to research, prepare, and ask for the input of others, don’t allow negative thinking and the opinions of others to psyche you out. Do your own thing. Take some risks. Try new things. It won’t work out every time, (because really, what does?) but more often than not you will create memorable experiences that others are not willing to attempt. 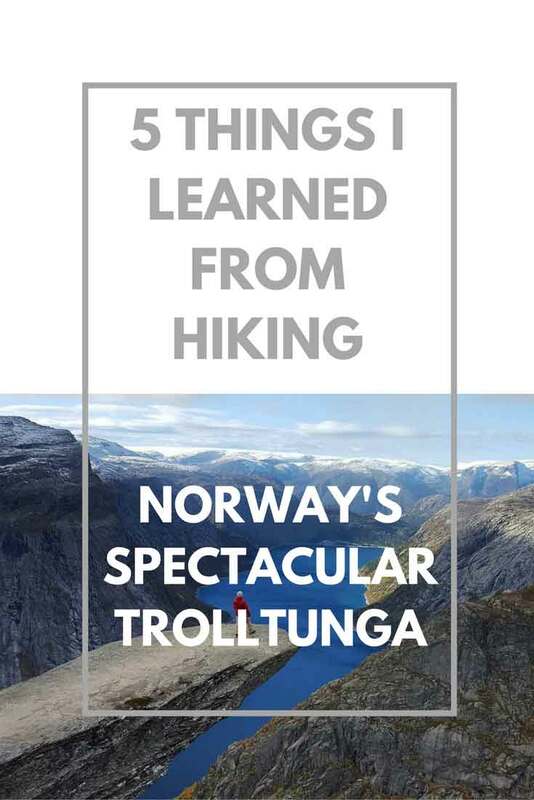 If you’re planning a trip to Norway, do not leave the country until you’ve hiked Trolltunga. It’s downright inspiring. And don’t forget to share your pics with me!